In Sydney and Melbourne, the cost of renting is in fact less than paying off a mortgage, according to the latest analysis from Onthehouse’s property research arm, Residex. 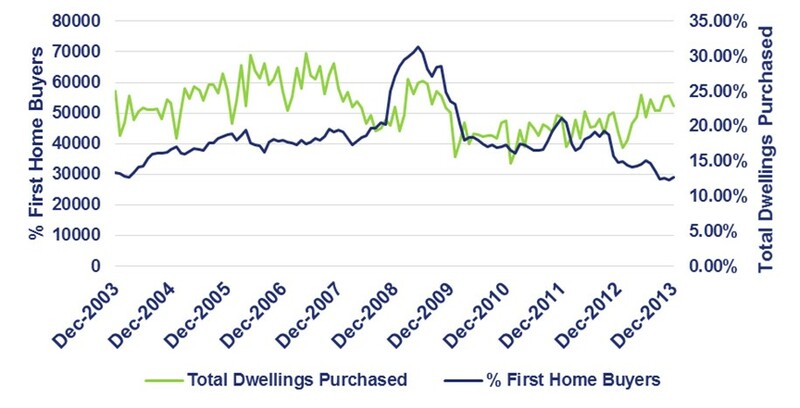 According to the latest data, the number of first time buyers hit historical lows in December 2013, to just 7% in New South Wales, 12% in Victoria, and 12% in Queensland. The national median value of houses and units increased in 2013 by 5.25% and 6.4% respectively. With prices going up and with affordability falling across the country, the value of loans to investors increased by 2.3% in the final quarter of 2013. Investors are currently taking advantage of low interest rates, particularly older generations who are now investing in property through their self-managed super funds. People are now structuring their super fund investments in such a way that allows a form of negative gearing in residential property, allowing monthly super fund contribute ons from their salary to cover any rental income shortfall. As a result, younger buyers and those looking to buy a first home are finding it increasingly difficult to afford to purchase property, especially in Sydney and Melbourne, and are therefore having to rent. In regards to affordability, the proportion of income necessary for renting or buying means that for many, it costs less to rent than buy. In Sydney, buyers can expect to pay 39.39% more per month on loan repayments on a median-valued house than it would cost to rent, while in Melbourne it is 50.72% higher. The difference is far less in other capital cities. Although prospective younger buyers can see the cost benefits with the short term gain of renting versus buying, it should not act as a deterrent from purchasing a property. Though it can be more affordable to rent for some, people shouldn’t be put off on buying property because of this. We need to keep in mind that long-term savings from paying off a mortgage and capital gains on your own property, can outweigh the short-term benefits of affordability. Also, because there is a strong market of renters out there, now could be a good time for those looking to get onto the property investment ladder to get their foot on the first rung. The data shows that there are just two cities where it is more affordable to buy a property compared to renting one. 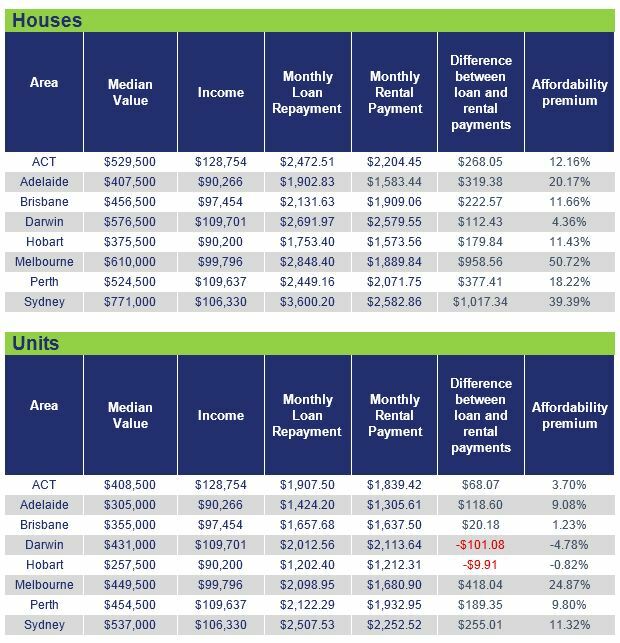 In Darwin, paying off a loan on a median value unit costs on average $101.08 per month less than renting (-4.78%), while in Hobart an owner could expect to pay $10 per month less (-0.82%). The increasing activity of investors has been a feature of the market for a number of years and can be traced back to the start of significant affordability issues for home owners. It’s also expected that investors will be ramping up their presence in the market. Overall, the general indicators suggest that Australia is moving to a situation where a large number of families are going to be renters unless something occurs that diminishes housing costs. Renting in capital cities looks as though it will be the natural outcome for young working families in these areas.